While the sun is slowly returning to Spitsbergen after the polar night, the discussion about new huts for commercial use by local tour operators is going on: Should it be possible to build new huts in the field? The discussion started with the last Stortingsmelding, a government policy statement issued in 2016 that drafts an outline of politics for Svalbard for the years to come. With the background of diminishing coal mining, most parties involved agree that tourism should be developed as a cornerstone for the local economy in Longyearbyen. To help this, the Stortingsmelding opens for the possibility of new huts being built for use by local tour operators in the context of their organised tours (not for individual use, neither commercial nor private, to be clear on this). 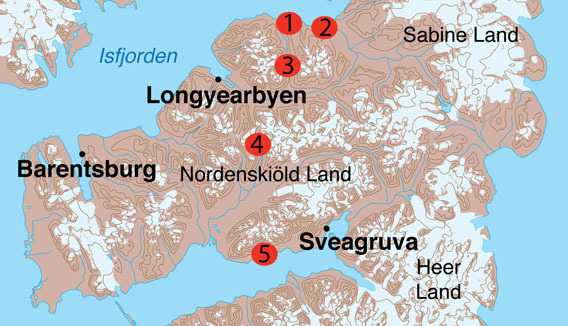 Activities are supposed to be more or less close to Longyearbyen, at least within administration area 10, between Isfjord and Van Mijenfjord. The use of huts for tourism does not have a tradition in Spitsbergen and it is controversial, to put it mildly, as opposed to mainland Norway, where the use of huts for tours is well established and open also for tourists. In Spitsbergen, only locals may use huts privately. So far, there are only 3 huts outside Longyearbyen which may be used commercially. One is near Nordenskiöldbreen in Billefjord, another one is at Brentskardet in inner Adventdalen and the third one is close to Sveagruva in Van Mijenfjord. Now the question is if and where further huts should be permitted. Local tour operators could file their applications in 2017 and everybody could comment on the applications until end of Janury 2018. The Sysselmannen received twelve statements with relevant comments (plus 8 without comments). These statements came both from private persons and from institutions including the Miljødirektorat (Norwegian environmental authority), the Norwegian Polar Institute and the Riksantikvar (protection of historical monuments and sites). Most statements share an altogether critical attitude. The Polar Institute examins all potential sites for new huts regarding their ecological values and comments on the damage to the environment that permanent infrastructure may have in these places. Private persons from Longyearbyen, including some of the few trappers who are still active in Spitsbergen, seem to share a very critical perspective. Remarkably, rather than general opposition to the idea of huts (there are, of course, pros and cons to this as well), the statements mostly offer a detailed discussion of the specific sites. These sites are being discussed for new huts for commercial use in Spitsbergen. Elveneset (point 1 on the map) at the mouth of De Geerdalen in Sassenfjord. The idea of a new, commercially used hut in one of the last lowlands and river delta areas close to Longyearbyen currently without any infrastructure is not met with any enthusiasm at all. The values of this tundra area for wildlife such as reindeer and polar foxes are highlighted and stand in contrast to regular use. A new hut would be near a fox den. Pretty much all statements look critically at the idea of a hut at Elveneset. This includes the Miljødirektorat, which will presumably have an important say in this discussion. Sveltihel (2), a lowland area in Sassendalen on the coast of Tempelfjord. This site does not seem to conflict too much with the local environment, but according to the important Miljødirektorat, it is too far away from Longyearbyen and too close to a national park. Kreklingpasset (3), between De Geerdalen and Helvetiadalen. According to the various statements, one of few sites that can at least be considered for a new hut, without too much potential for environmental or other conflicts. Locals, however, see their regularly used tour areas compromised. Tverrdalen (4), south of Adventdalen. Away from the coast as Kreklingpasset, and additionally not near the commonly used routes for private and commercial tours and without much potential to disturb the local environment. The site is hence likely to remain in the discussion. Langneset in Van Mijenfjord, between Sveagruva and Reindalen (5). All statements are explicitely critical regarding this site. 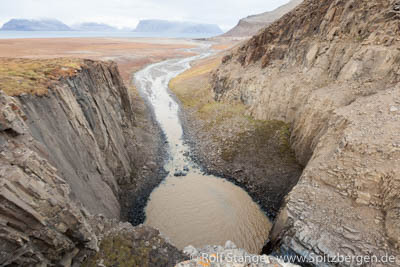 Van Mijenfjord is the only fjord on the west coast of Spitsbergen that does still freeze during the late winter, at least in its inner reaches, as it is sheltered from the open sea by the island Akseløya. Hence, Van Mijenfjord is an important area for seals to give birth, and there seem to be several polar bears rather stationary in this area, including females who use the area to give birth in snow caves. Extending regular tours into this area is an idea that most people and institutions do not like. If the Sysselmannen takes the statements seriously, then this site should not have a chance to remain in the discussion. The number of permits that will be issued in the end is not defined. In theory, it might be all sites or none. In any case, there will be strict regulations for the use of the huts: only within the context of organised tours, no additional traffic in the field and preferably non-motorized access etc. But some fear that it may be difficult to control how the huts are used and related tours are operated in practice, once the huts are there. Also the author of this article sees the establishment of new, permanent infrastructure in so-far largely untouched nature areas critically. If additional infrastructure is to be used in the field, then one might also opt for mobile solutions that can be used seasonally and easily be removed without a trace after the season. This would also make it easier to control the future development in case of unexpected, undesired developments. Der Hyperittfossen, a waterfall at Elveneset in De Geerdalen: the mostly untouched landscape and nature would hardly benefit from a new hut.